Who doesn’t love rich, decadent chocolate? It’s a pleasing sight to the eyes and it pairs well with many colors — both subtle and rich. As you survey Fusion Mineral Paint Chocolate, you’ll be brought back to visions of your favorite quality brownies or chocolate syrup. Sure, you can’t bite into this paint, but the point is that you’re looking at something that’s sure to appeal. Don’t believe us? Take it from the experts. (I’m sure those who love devouring chocolate have no qualms with that statement, right?) But our focus is the color. It’s bespeaks of strength, resilience, comfort, and warmth. And what beats Fusion Mineral Paint’s line of colors in your effort to incorporate chocolate into your decor? Fusion Mineral is a quality paint line, bringing timeless colors to people of today. Not only are the colors to die for, but the quality of the milky paint makes application a relative breeze! We’re all about quality and efficient application here. As you may have noticed from previous articles, it’s why we adore Fusion! And now for our favorite part of this series! It’s time to move from talking to action. But how? We’re going to show off some wonderful ways that Fusion Mineral Paint Chocolate is used to spruce up some old furniture. We love seeing a bit of furniture given new life with a coat of Fusion. And we think you will too. Ready for this tour of inspiration? Let’s see what others have done! Fusion Mineral Paint Chocolate takes its place in the conglomeration of paint here. 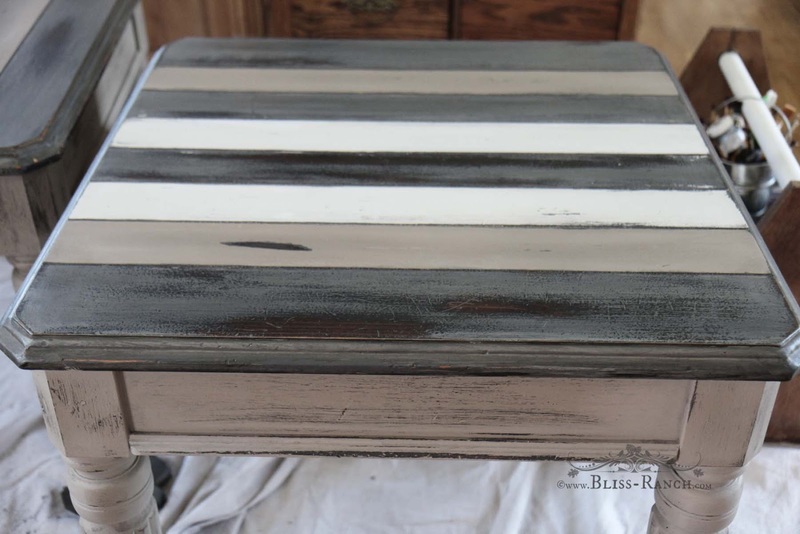 For the distressed look, the blogger used several Fusion paints to bring about the effect. If a distressed aesthetic fits your style, Chocolate can play a role in that. For a classic desk with a fresh look, you can slather on some Chocolate. This desk went from drab to fab in a flash thanks to Fusion Mineral Paint Chocolate. This blogger distressed the edges, giving it a nice touch of character. Talk about classy and timeless! Here’s another idea. Bring the Chocolate vibe into your kitchen by giving your kitchen table and chairs a facelift. The rich shade of brown gives the kitchen set a nice touch to the kitchen. It pairs well with a variety of colors that could be brought into a kitchen setting. In spite of the classy nature of the color, it could pair well with a modern style if that’s more your thing. Now it’s time to look at the possibilities that come with Fusion Mineral Paint Chocolate. What are some of the color combinations that would work with this fine, rich hue of brown? We’re glad you asked. Chocolate’s rich brown may inspire you to think on your morning routine of drinking coffee. Awakening, caffeinated goodness to fuel your day, coffee is often a welcome sight. In this palette, you can run wild with a coffee-themed motif. A range of different browns and a light creamy shine can add to your furniture or decor’s motif. Give it a go and see what comes of it. If we were you, we’d go beyond this palette and imagine what colors go with the coffee bean. Think of the coffee tree: greens and reds are some colors that come to mind in an instant. Now if this doesn’t sell you, we don’t know what will. This delicious blue pairs well with the rich chocolate goodness here. Bring in some white and you’re welcoming a soothing color combination into your home and decor. For a blue that you might like to combine with Chocolate, try Fusion Mineral Paint Champness. There’s something majestic about this pinkish warm red. It adds a touch of royal grandeur to the warmth of the Chocolate. Contrast it against white and you can take this into a minimalist motif, depending on the amount of white space you have on hand. Fusion Mineral Paint Chocolate is a color that can strike some timeless spice into any style at any time. Don’t just think of chocolate in terms of a reward or a special occasion. Own it all year long with Fusion’s line of paint.